The ruins of Teotihuacan, just outside Mexico City, are Mexico’s most popular archaeological attraction. On a busy weekend, the line to the towering Pyramid of the Sun goes all the way down its 248 stairs and wraps halfway around its massive base. Of course, there are a lot of souvenir hawkers. The fabled Avenue of the Dead running through the heart of the ruins is noisy with the shouts of people selling obsidian blades, jaguar noisemakers, and crystals that supposedly channel ancient mystical powers. Nestled between the Aztec masks, novelty sombreros, and tequila shot glasses sits Gabriel Vistrain Andrade’s odd little shop. Dark and sparsely decorated save for a couple of sculptures in the window, it looks more like a workroom. 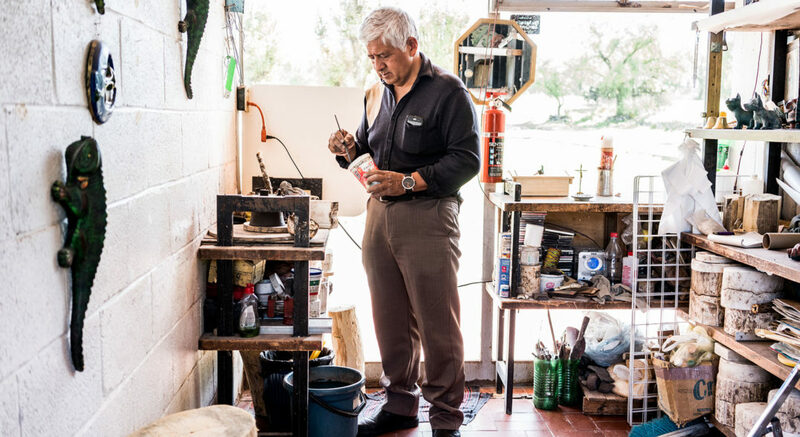 Here, the 58-year-old artist is quietly holed up inside, creating incredibly intricate carved sculptures that bring the long-dead Teotihuacan society back to life. Vistrain holds up one of his art pieces: a half-flesh, half-skull head made of clay. He decorated one side with a god of fertility, storms, and life, while the other shows a god tied to death and fire. The piece blurs the line between archaeological replica and modern invention, between tourist trinket and valuable art. The skull isn’t a copy of anything ever found at Teotihuacan but more like something the ancient peoples here might have made if they were alive today. The head symbolizes Teotihuacan’s seasons, which flip between a verdant green during the rainy summer and autumn, and a withered brown during the winter and spring. The peoples who lived here long ago clearly appreciated the contrast too, based on their iconography and architecture; some experts even say that Teotihuacan’s two major pyramids (commonly called the Pyramids of the Moon and the Sun) represent the wet and dry seasons. Vistrain wants his art to help him communicate with both 2,000-year-old artists and the tourists who come into his shop. With no formal training in archaeology, he has become a student of iconography in order to create scenes and tableaux that are almost hypnotic. In doing so, he walks a fascinating tightrope between cultural tradition and creation that, when done well, helps us all feel more connected to our past. The ruins of Teotihuacan are a vast archaeological complex. From the top of the Temple of the Sun—the largest exposed pyramid in Mesoamerica—you get a commanding view of the surrounding valley that some say held as many as 200,000 people and was one of the largest cities in the New World, filled with mysterious tunnels, stunning murals, and untold offerings to gods whose names have long been forgotten. The city of Teotihuacan was built around the first or second century B.C., the same time the Roman Republic was dominating the Mediterranean. Like Rome, Teotihuacan had a huge impact on the surrounding region. Its peoples traded throughout Mesoamerica and likely conquered sites as far away as the mighty, ancient Maya city of Tikal in modern-day Guatemala. But unlike the Maya, the Teotihuacanos had no form of writing, so much of their politics, culture, and religion were lost or co-opted by later civilizations after Teotihuacan mysteriously collapsed around the eighth century. Scientists don’t even know the site’s true name. (Teotihuacan and all its structures were named hundreds of years later by the Mexica, or Aztecs, as the Spanish called those who settled nearby in what is now Mexico City in the 14th century.) All we have is their artwork and stone monuments. But to the trained eye, artwork can say a lot. Iconography is extremely diverse across Mesoamerica, with stark differences between ancient traditions. For instance, the Maya used fluid lines to depict actual kings and everyday life, while the Mexica (or Aztec) preferred strong edges showing supernatural creatures and sacrifice rites. Teotihuacan art, in contrast, had a far different aesthetic, showing florid scenes of ceremonies and supernatural events in a boxy style. When Vistrain set up shop at Teotihuacan in 1989, he didn’t know any of this. He had grown up in a nearby town, working in his father’s pharmacy in the days when pharmacists made drugs by hand. (His father’s shop was so timeless that a company bought it and reassembled it in a Monterrey museum.) But he wanted to be an artist, so he opened a shop and started carving clocks for tourists. More than any other place in Mesoamerica, Teotihuacan has come to symbolize unanswerable questions. Who were the Teotihuacanos? How did they rise to dominate the region? Why did they fall? Where did they go? These mysteries go back long before the Spanish arrived and have always been frustrating for the expert yet captivating for the layperson. Archaeologists attempt to glean clues from the subtlest markings, while enthusiasts concoct fantastical supernatural explanations to explain the people who lived there. Through his work, Vistrain has developed a special affection for the storm and fertility god because the god reminds him of the wet season. The artist’s face lights up when he speaks of the field behind his shop that turns into a network of tiny rivers, like the myriad lines on his art. The original artists of Teotihuacan seemingly had a similar affection: The city looked forward to the annual rains as a return of life and fertility. As an art historian, Scott chafes at the distinction some draw between good art (in museums) and bad art (sold to tourists on the roadside). She freely admits to buying every sort of trinket, from the cheap plastic keychain to the wood statue, handwrought by a master carver. Vistrain agrees, sitting in his tiny store littered with books filled with sketches of images from a long-dead civilization. The day I was there in April, he sold an intricately carved skull that had dropped from a shelf and broken. The customer, who owned a trendy hotel, loved the ancient feeling created by all the cracks. For a brief moment, the artist and customer seemed to connect over a shared aesthetic. Both saw a reflection of the old in something new. And for Vistrain, that’s what it’s all about—connecting people with the artists of Teotihuacan.